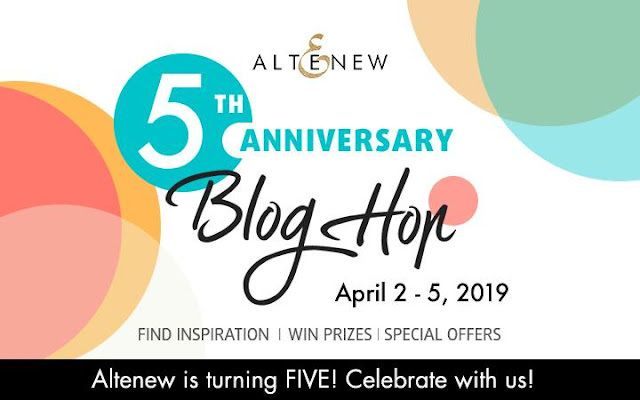 So excited to be joining in the fun with Altenew's 5th Anniversary blog hop! Be sure to check out all of the information on the Altenew Card blog! You should have arrived here from Emily Midgett's Blog! And our very own Erica is sharing this GORGEOUS card! For this card, which is a lot bigger than our usual A2/5.5"x4.25" card, I used the lovely Beautiful Day stamp set and the coordinating die. Instead of colouring them with water colours, Artist Markers or other type of medium, I decided to do some stamp layering. With the help of some yummy Altenew inks, from the Warm & Cozy bundle(which you can get in both the mini cubes and separate oval ink pads Sunkissed, Orange Cream, Autumn Blaze and Firebrick) as well as Sand Dunes and Rocky Shores from the Coffee Break bundle. Instead of using the darker ink to stamp the outline, I used Altenew embossing powder in Antique Gold, Copper and Rose Gold. It gave all the flowers a very nice little something extra. I also stamped up some of the branches and leaves from the Beautiful Day stamp set, on white card stock. These are heat embossed too and then I blended some of the Orange Cream and Autumn Blaze on them in an ombré way. All the flowers, leaves and branches were then cut out with the coordinating dies and set aside. 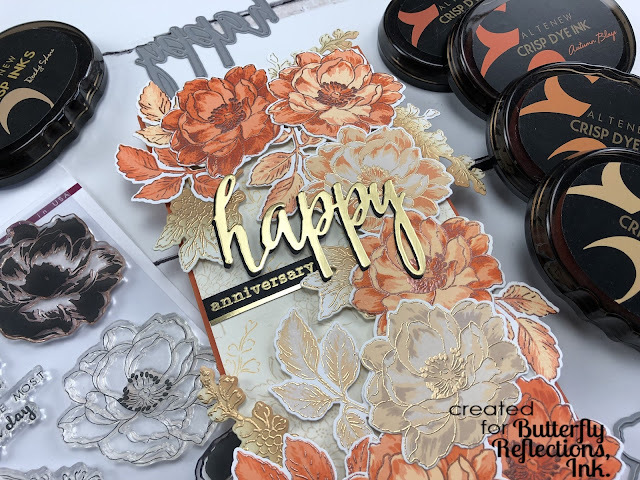 The big card base was created with a warm orange card stock and a vanilla coloured one as the background panel, to compliment the colour scheme of the flowers. On the vanilla coloured panel I stamped some of the branches in Sand Dunes and Sunkissed. After adhering the vanilla panel to the card base, I used that as a guide and placed the flowers in a framed way around the edge. With some Post-It tape (you can use Press'n'Seal to make things easier) I taped them all tougher and turned the whole thing over. I cut some foam tape out and added that to the back, to raise the whole thing up. On a slim strip of black card stock I heat embossed the word 'anniversary' from the Mega Succulent stamp set. I used Antique Gold again as I had the idea to line the strip with gold card stock too. To finish off the sentiment I diecut 'happy' out of black and gold card stock. These I layered up with with black on the bottom, to shadow it. With all these pieces ready, it was time to put the whole thing together! Which took barely any time at all given that all the bits and pieces were finished. Ta-da! Your next stop is Jessica Frost-Ballas! Please see below for the full hop and sponsor list! Beautiful card - so full and colorful! This is the set I return to again and again. This is the most beautiful choice of colors I have seen with these flowers! The little bit of gold embossing just sets it off spectacularly. Thanks for the inspiration. What is the finished size of the card? Stunning beauty at it's best! Loved the stacking of Beautiful blooms on this card ! Gorgeous choice of colors. This card is delicious and luscious! WOW! A whole bouquet of lovely flowers! STUNNING card! Happy Anniversary to Altenew!!! I love this, so lovely. What a lovely card! Love the color combo. Lovely card. Thanks for sharing! WOW, beautiful card! It's a work of art that could be framed and hung on a wall. Thanks for sharing. Absolutely stunning! This card is breathtaking! Love the Autumnal color palette. Thanks for the inspiration and happy anniversary to Altenew! Love the vintage look you achieved! when I first saw this page, I just 'ahhhhh'ed. So gorgeous and I love, love, love the colors. Love your card it has a victorian feel to it. Great job! Happy Anniversary altenew!. I;m enjoying day 2 of the blog hop. love the colors in your card! Wow, your card is amazing Erica, the size, the color choices everything about it is superlative. 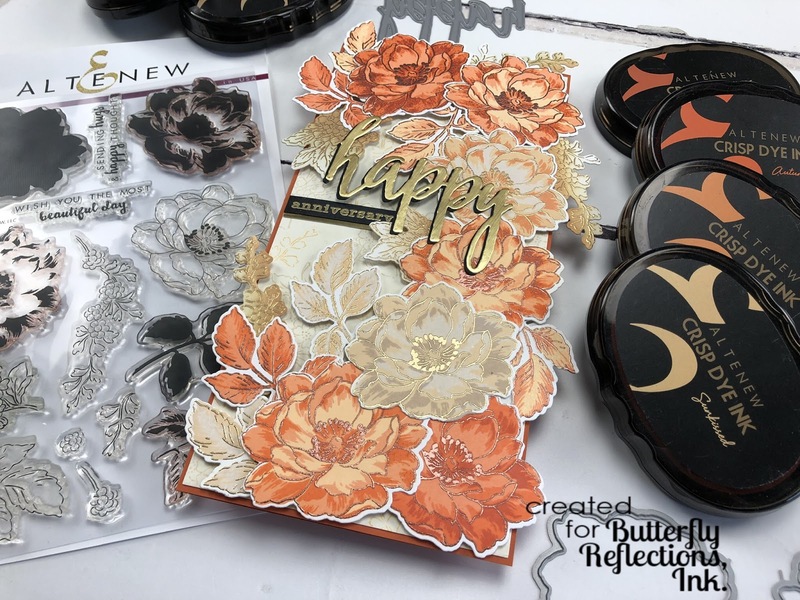 I feel very inspired to get my Beautiful Day set out and get stamping! Gorgeous card with all those beautiful blooms, and I love the coral/orange colors with the gold foil sentiment! Gorgeous creation, I love the woodsy colors! Altenew, CONGRATULATIONS on your 5 year anniversary! What an awesome celebration! Beautiful! I love how you used the ink to color your flowers.It is a nice and soft look. Thank you, Butterfly Reflections Ink for celebrating with Altenew. Beautiful, full of celebration, love the ink coloring and the profusion of embossed flowers. Love the oranges, it is a color I seldom use, but will have to give it a try now that I see how lovely it can be on a card. Love the colors with he gold accent phrase. Beautiful. Such a unique card. Love the colors. Amazing new colors and design . Love your card. What an amazing card front that has lots of layers, thank you. Wow! This card is stunning. I love the colors. Love these colors reminds me of autumn. Very pretty. Great color choices! What a fantastic display of the Altenew layered stamps. Thanks for the inspiration and congrats to Altenew! Now THAT is a big floral hug. What warm colors! Love it! I don't know how long it took to make this card but it was so worth it. Stunning. I love the use of various metallic embossing powders. It really helped make a statement. Love the colors you used and the Beautiful Day stamp set. Nice layout and positioning. Thank you! Your card is absolutely stunning! Whoever receives that card is one lucky recipient. Happy 5th Anniversary to Altenew. Oh My, this is beautiful! Wow! Your card is so dynamic. Really love the flowers. Awesome job. Thanks for sharing your creativity! What an incredible group of flower clusters!!! Wow, such a beautiful card. I love the use of gold. A keepsake card! I love the embossed outlines. Erica's card is just UNBELIEVABLY STUNNING!!! I would love to receive this card!!! Love your card! It is practical bursting with gorgeous colors. I like how you used the embossing powder! Beautiful colors on your card. Could be used for so many occasions. Lovely colour combo and a fabulous card! This is so beautiful and elegant! I love those colors and the embossing is just an extra wow factor. Stunning! Gorgeous card, love those blooms and the touches of metallic embossing are fantastic. What a pretty card! So many flowers. I love those peachy colors they are so warm and inviting. The colours and embossing details - WOW a stunning card! Love the bigger size card and all the flowers in such a pretty color. The metallic embossing is the perfect finishing touch. This is exquisite!! I love the subtle variation of the color layering! Love the colors in this card. Beautiful card.....Thank you for sharing. Oh, my! this is a gorgeous card! Thanks for the inspiring colors! Oh, my! This might be my favorite card ever! LOVE the colors - so elegant! This is amazing! I love the colors and the gold sentiment! What a gorgeous card! Love the size and the pretty layers of flowers. The gold embossing adds such an elegant touch to this lovely piece. Happy Anniversary to Altanew! What a labor of love!! This card is spectacular!! Love the colors and the size of the card. Beautiful Day is one of my favorite Altenew flower sets. such a unique and gorgeous card! What a cool technique. The colors are really beautiful. Thanks you so much for sharing. Love the colors! Beautiful card! Love the variety of colors in the card. The flowers are beautiful. 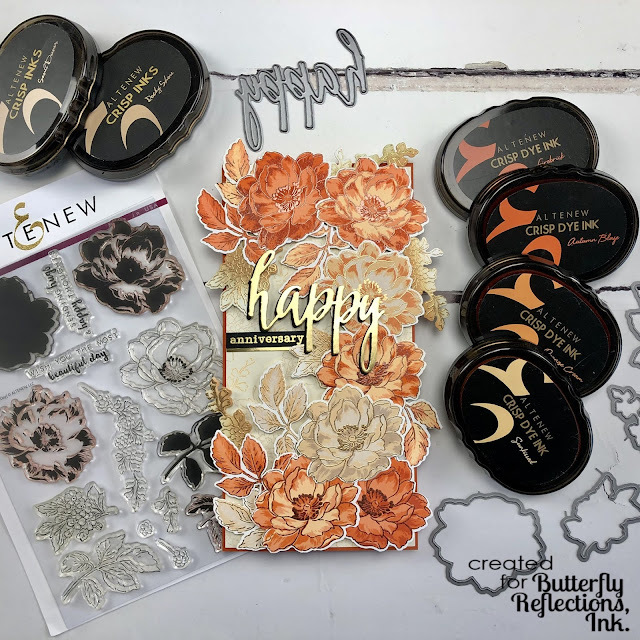 A perfect showcase of the Altenew Beautiful Day stamp and die set. The gold embossing perfectly showing the stamp set colours. Love all the extra bitties as well. Gorgeous card. What a beautiful creation to celebrate the 5th anniversary of Altenew! Looks great! That is my fav Altenew set and you have made such an amazing creation with it. Just stunning and so original - great design!!! I have never used those colors together. I've always stuck my nose up at anything with orange in it. But I love this! Need to branch out and try more colors. Lovely card! The gold accents are so lovely! Wow, stunning combination of embossing and color. Love your card. Wow! Just stunning orange blooms!! Gorgeous card. Love the embossing. Happy 5th Anniversary Altenew! That anniversary card is so rich looking. Great job!! Amazing! Love the color and my favourite stamp! The colors are so warm. It just adds to the warmth of the card sentiment! That card is beautiful! Those colors and the detail are amazing! Love it!! Very lovely card. I love the Wallpaper Art stamp set. It is just soooo pretty....and I own that one...so I will strive to make my cards as lovely as the artists on this blog hop....thank you so much for sharing. I love the gold embossed details! Very striking. TFS! Nice! Thanks for the chance to win and sharing. What an incredible card, I adore this! Lovely combination of colors. Thank you for sharing. Way to go Altenew! Wow!!!! What an amazing card, Erica!! So gorgeous with the rich colour tones! Thanks so much for sharing and for your wonderful inspiration! It's an explosion of flowers! Beautiful flowers! Really lovely! Love the soft color of the blooms. Oh my gosh! Stunning! Love your flower and color choices. Thank you for sharing. Happy 5th Altenew! What a lovely card, I love those touches of embossed gold! Gorgeous card, love this stamp set. The color combos on this stamp set are stunning! Love the gold. This Altenew stamp set is one of my favorites! I love those colors together and how you used the metallics mixed in as well! Gorgeous card and I love the layers and the elegant look. So beautiful! Stunning card and those awesome colours, I love them! Thank you for your inspiration and participating in this great Altenew 5th Anniversary party and for the stunning prize contribution. Now that is a card!!! Amazing coloring. So rich looking. Love your design layout. so pretty, your embossing powders truly do add a special effect. This feels like some really fancy wallpaper from my great-grandmother's house came to life. (That's meant to be a compliment, in case that didn't come across.) I love the vintage colors and the little pops of embossing. Just a stunning card. I don't know that I'd be able to send it away! WOW - those flowers are really gorgeous! Those soft, pretty colors look amazing together! Wow, what a stunner! Gorgeous and unusual colors! Beautiful Day and Painted Flowers are my most-used Altenew flower sets! These colors are stunning! I love your project. A happy and beautiful card. The colors are grand. Oh my goodness, this card you made is absolutely gorgeous! I love this set and it is almost always sold out. I really like the color choices that you did. Thanks for sharing such a beautiful card with one of Altenew's best sets. What an elegant card ! The ink colors from Altenew compliment their stamp images so well ! I wouldn’t have thought to use these colors, but I think it’s one of the prettiest cards in today’s hop. Thanks for joining in on Altenew's 5th Anniversary blog hop! Beautiful creation! This is wonderful Erica. A stunning card. Your card is absolutely mindblowing. So much depth with a minimal colour palette. It truly is a work of art. Wow, your card is stunning! The orange shades with the gold embossing is just gorgeous. I love the layered stamps and this is such a beautiful set. Oh WOW! This is like gettting an actual bouquet. Magnificent! Thannks so much for sharing your inspiration. Erica, your card is breath-taking. Love everything about it. Wow your card is absolutely stunning, love your colour scheme, its an amazing design!! This is one of the most exquisite floral cards I have seen! Love it!! I love the gold accent you put on this card. It looks really elegant! Gorgeous card - so much detail and richness! Love the gold against those warm colours. What a classy card ! The colour palette in combination with the black and gold is great ! Thank you for sharing this project. And thanks for sponsoring this great blog hop ! This card is absolutely stunning, Erica! Love your color choices, so unique and pleasing to the eye. The leaves as well. And I like the elongated card look, too! Thanks for another awesome idea today! What a beautiful card! Love the layering and the colors are gorgeous, would be perfect for fall. Thanks for sharing and Happy Anniversary Altenew! Happy Birthday Altenew and many more! Wow! I wish it was in a video - it's so beautiful! I'd like to be able to make something close to it! What a card! One of my favorite sets! This is so beautiful! So many great details! Your layered card is beautiful! Wow oh WOW! This is such a beautiful card. The colors are amazing. That set is such a classic! One of the all time best stamp sets ever. I can hardly wait to use your example to help me make a very similar card. I love the colors you used for the flowers and will use my Beautiful Day stamps for my next card. The gold and black for the wording was most impressive. Must go try it now!!! Your card is beautiful. Your flowers are so amazing..Loved how you tried a different card size than usual... Colors are just perfect! LOVE your flowers & leaves, ADORE your warm colours & inky layers - WOW - it's a STUNNING design and will definitely be making lots of hearts HAPPY! Wow! Stunning work! I love this stamp set. I think I really need to add it to my stash! Absolutely gorgeous card! I love the colors and stamps you used! WOW - cool card! I love all those flowers and the touches of gold! Such a pretty card! The colours are fabulous and love the gold happy! OH MY GOODNESS!! Your card is stunning! !I love all of the layers of flowers in gorgeous sunset colors! Thank you so much for the inspiration! Happy Anniversary Altenew! This card is absolutely exquisite! I love the layering that you did and all the gold details... really in awe, it looks so beautiful! Love the color palette used in this card...and the gold is the icing on the cake! Wow--this is gorgeous. Love colors and the gold. I am adding this stamp set to my cart right now. This is by far one of my favorite cards to date. It's stunning and gorgeous. Thank you for sharing this beauty with us. Wow. So stunning. And using inkpads only. Thank you for posting.